Dating all the way back to the 1900s, messenger bags have been used by postmen, bicycle couriers, telegraph messengers and telephone linemen. 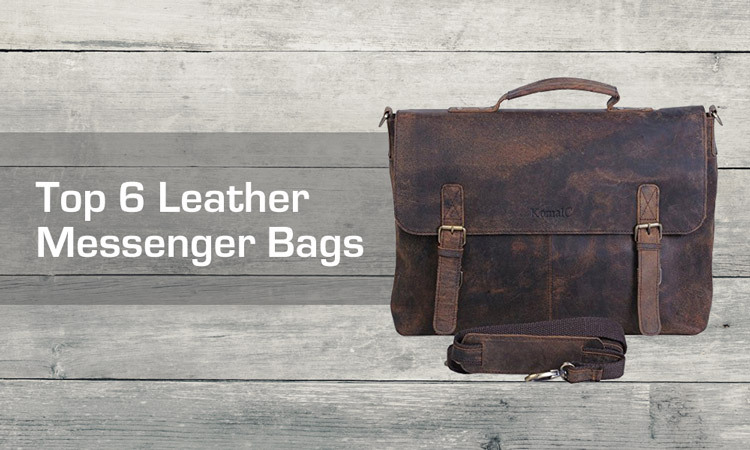 Leather messenger bags are a popular alternative to backpacks, and briefcases. And for good reason. They can usually carry the same amount of goods, but they are easier to access since you can wear it cross body and simply swing the bag to your side or front. Just like briefcases and backpacks, there are lots of different designs, enough to fit any style or need. A messenger bag in leather is a wise investment since it’s something we use daily and need to last. This article features some more high quality leather messenger bags. I’ve looked at a ton of bags to find the best options. I choose some more classic designs with a more business appeal, along with a few more trendy and rustic bags. Here is my list of the top 6 leather messenger bags. This professional Kenneth Cole Reaction “Risky Business” Leather Messenger Bag has clean classic lines for a polished look. This Kenneth Cole Reaction “Risky Business” Colombian Leather Messenger Bag is crafted from full grain cowhide leather. The interior is fully lined with high quality material. There are 5 versatile color choices: tan, reg brown, brown, cognac and black. 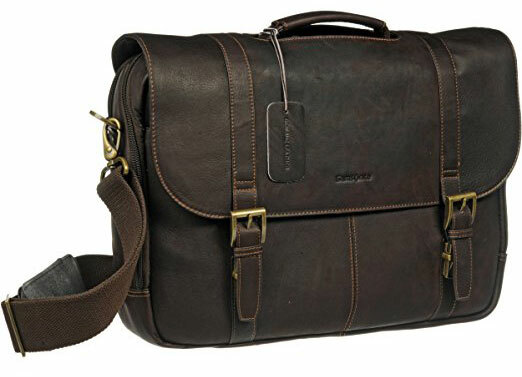 Unlike some of the other bags on this list, this bag is not a distressed leather which makes it a little more professional looking for business use. When you open the flap you get two front easily accessible gusset pockets. The roomy main compartment features a full length zipper pocket and cell phone pocket. A rear exterior open pocket is also provided, that measures the length of the bag. For handheld use there is a convenient leather top handle. For shoulder wear an adjustable padded shoulder strap is provided. 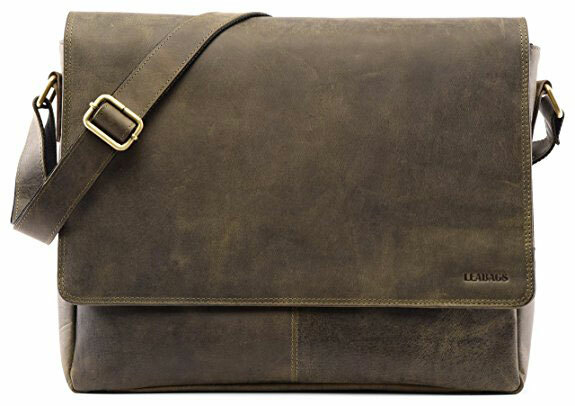 The Kenneth Cole leather messenger bag is a solid well crafted piece. It’s great for everyday use as a casual bag, but also appropriate for business use. 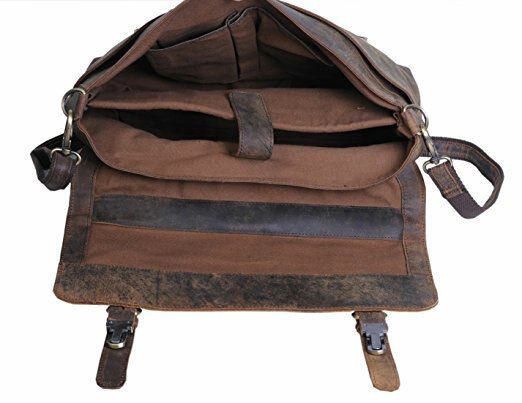 The Lifewit Vintage Canvas & Leather Messenger bag has a retro two toned look, with the cowhide crazy horse leather and durable and rugged wash canvas fabric. It’s durable, features lots of pockets, and has a comfortable shoulder strap. All of that, for only around $60, makes this bag a smart buy. 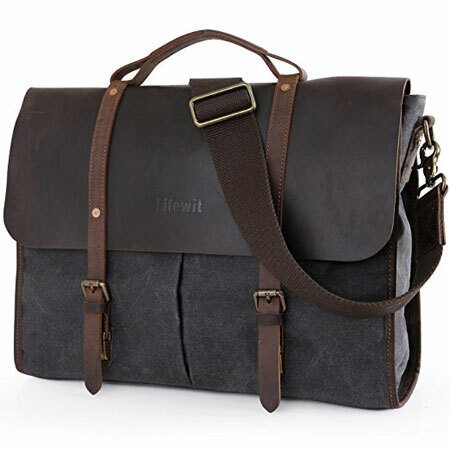 The Lifewit messenger bag is made to last with the cowhide crazy horse leather and durable and rugged wash canvas fabric. The 3 color options give it a really cool retro vibe, while still looking professional enough for business use. This “updated briefcase” is smartly designed with inner and bottom foam padding to protect electronic devices by absorbing impacts that are typical in daily life. 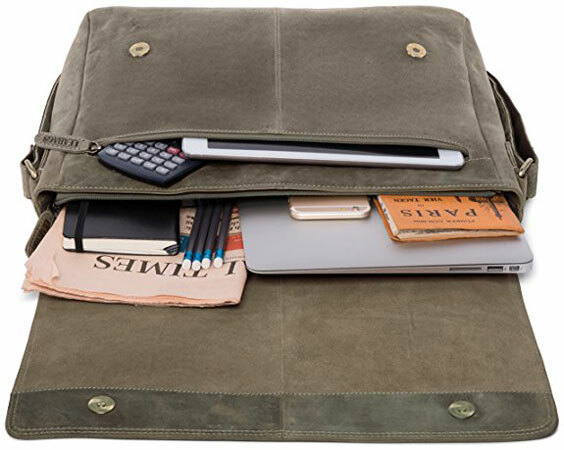 The bag’s padded main compartment is designed to house a 14-inch laptop computer. It’s also equipped with 2 larger front pockets, 1 zipper pocket for items such as wallets and identification documents, and 2 Inner wall pockets to store cellphones, chargers, earbuds, and glasses. An adjustable, removable, wide shoulder strap is provided, that is comfortable and decreases shoulder fatigue. The bag can also be carried by the top comfort handle. I’m a fan of this bag. The style is vintage inspired and on-trend. It’s made from durable materials that will likely last for years, and has a affordable price. Over 1,800 reviews and still excellent marks! The Samsonite Colombian Leather Flap-Over Messenger Bag lives up to the Samsonite reputation for high quality durability and stylish functionality. The Samsonite Colombian Leather Messenger Bag is made from a high quality soft leather. It comes in both a nice dark brown leather with antiqued brass hardware and a black leather with silver hardware. It appears like it will hold up over time and age well. It’s a very roomy messenger bag with tons of well placed compartments and pockets. Open the flap and there’s the front pocket perfectly placed for organizing items you want to reach quickly. The inside is spacious with a padded laptop sleeve and three pockets. Additionally there’s an outside sleeve pocket in the back with two zipper slots. There is also a padded, removable shoulder strap that adjusts for comfort and convenience. The top handle looks sturdy and reliable for handheld use. The hardware is heavy duty and has a solid feel. The fact that the Samsonite messenger bag has over 1,800 reviews and still manages to score 4.4 stars is a good indication your getting an excellent product with this piece. But just in case, it has a 3 year warranty! This effortlessly classy, unisex vintage inspired LEABAGS Oxford Buffalo Leather Messenger Bag is simply beautiful. Not only is it well crafted and durable but it comes in an array of 13 different leather colors! This beautiful LEABAGS Oxford Buffalo Leather Messenger Bag is vintage inspired with fine stitching and the excellent manufacturing. The genuine buffalo leather just gets better with time making this bag a stylish companion you can count on for daily use. Interior it is incredibly roomy. 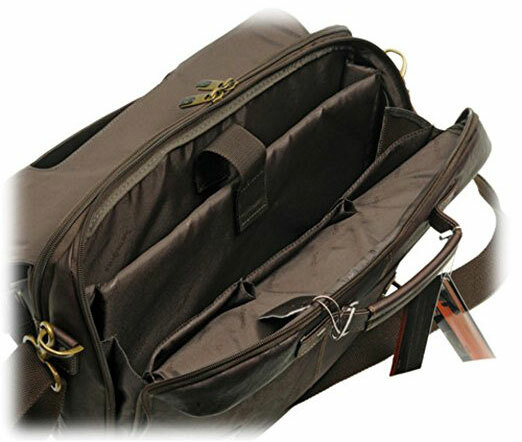 The many pockets and a large main compartment offer plenty of space to carry your belongings both business and casual. 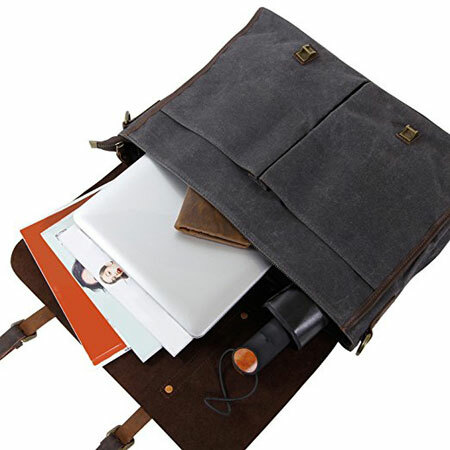 Your laptop or documents are in good hands in this bag since the designers gave special attention to making this bag well-structure, but by no means stiff. Thanks to its spacious inside you have plenty of room for a water bottle, notebooks, pens, phones and other electronics. The adjustable shoulder strap is reinforced by a strong nylon lining, which makes the bag more comfortable to carry. Out of the 13 colors, all are gorgeous. My favorite leather color, that I’ve featured here, is the Olive which is like a dark green with hues of grey/brown. This is a bag that is well crafted and likely to last for years. Out of the 7, I’d say this is probably my favorite. This would make an excellent gift for a college student, or business person. It’s affordable as well, at around $90 with a sale. Fossil is one of my favorite leather product brands. Their quality is always excellent with modern, yet on-trend designs. I have owned several different Fossil leather products over the years, and they have all exceeded my expectations with regards to durability. 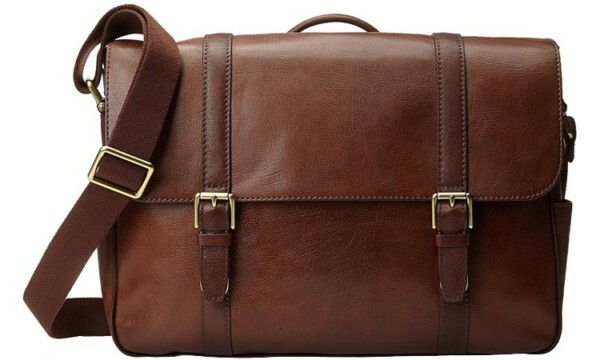 The Fossil Men’s Estate Saffiano Leather East-West Messenger Bag doesn’t disappoint. For more, check out my full in-depth review of the Fossill Saffiano Messenger Bag. 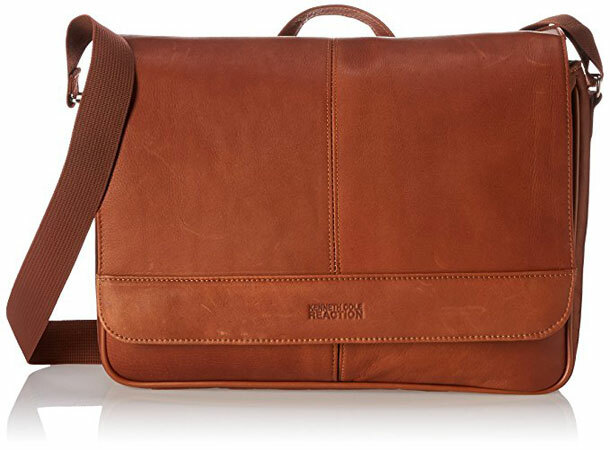 Fossil’s Saffiano Leather Messenger Bag is exactly what is expected from a messenger bag. Nothing elaborate, but looks and feels great. As far as design, it has the standard messenger bag features. For example, a top flap to cover or access the bag’s compartments. The flap closes with 2 push-button straps with decorative buckles. There is a leather handle on the back for easy carrying or you can use the adjustable body-strap. As far as organizational it’s well-equipped with 9 different sized and styled pockets. Inside there is 1 zip pocket and 4 slip pockets. The exterior has 3 slip pockets and 1 card slot. The largest exterior pocket, which is on the front under the top flap could fit a small tablet, your phone, and so forth. The inside compartments can hold quite a bit. Now you won’t get a large laptop, but 13″ laptops will slide in nicely. In fact, you should have no problem fitting a 13″ laptop, tablet, notepads, and couple of books. Although I haven’t personally done so, one online customer says that he is able to put his 15″ Macbook Pro in the messenger bag, so it’s possible other 15″ laptops could fit. I feel that if you are going to buy leather, then you want leather that looks and feels great. After all, you will have it for years or even decades! For those who would use it everyday for work, or are looking to buy a gift, then it is a great investment. For more information and pictures on this product, hop to my full Fossil Saffiano Messenger Bag Review. Made from the finest Hunter buffalo leather and lined with high quality canvas this KomalC Retro Buffalo Hunter Leather Messenger Bag is hand crafted to last for years. Out of the top 7 this bag is the most rustic looking. 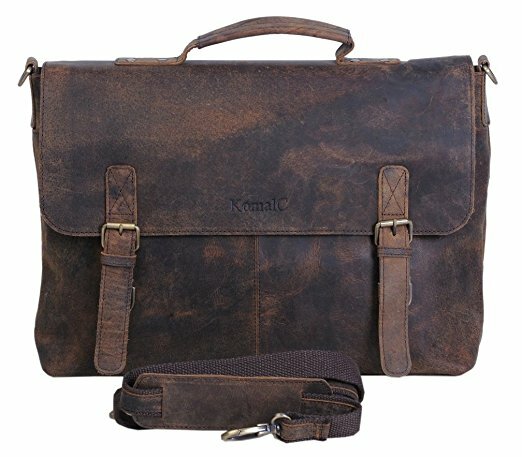 If your looking for a more rustic looking leather bag the KomalC Retro messenger bag is an excellent choice. It’s retro design is stylish and trendy, plus it’s high quality materials make it a loyal companion. When you pull up the flap you have a nice pocket the length of the bag. Then the main compartment has got plenty of space inside for a small laptop along with, notebook, pens, and so on. There a couple of smaller pockets to keep essentials tidy and organized. I really like how the inside is made of a canvas material. Not only does it look really cool, but appears to be very durable. 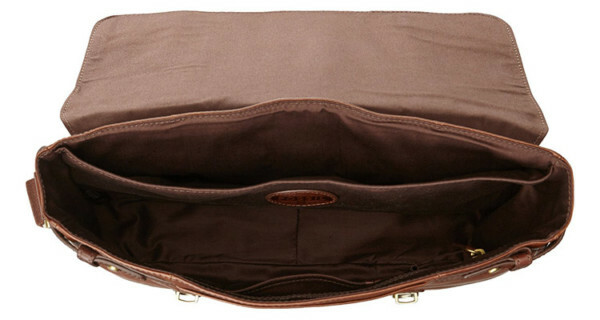 The back has a convenient zipper compartment that could fit a tablet or smaller documents. As with the other bag is has a adjustable comfortable strap and a top leather handle. No doubt this bag would be an appreciated gift for a more rugged guy with a rustic style. It may be a little less formal, then the other bags, unless your job is more laid back, or you make your own rules! But it’s fitting for a college student or for casual use.